The humble Garlic is a powerful yet simple herb that promotes active health and nutritional healing, while strengthening our prevention against health disharmony. It has credible health benefits for a number of illnesses because of several unique compounds it contains, especially allicin. Garlic also contains small amounts of vitamins A, B, C and E, and the minerals potassium, phosphorus, calcium, sodium, and iron. It is very easy to source with a plentiful supply in most countries. It is a herb that is easily incorporated in your food or it can also be eaten on its own. Fresh garlic is preferred but dried garlic or powder are just as effective and have a long shelf life in our home cupboards. The health food store may recommend garlic dietary supplements for prevention of heart disease, cancer, and diabetes. Garlic is most commonly taken for high cholesterol, heart disease, and high blood pressure and to prevent certain types of cancer, including stomach and colon cancers. Garlic may help in weight loss. The recommended dosage for adults is no more than one clove two or three times a day and that children have one quarter to one half a clove, once or twice a day. Garlic cloves can be eaten cooked or raw. They may also be dried or powdered and used in tablets and capsules. Raw garlic cloves can be used to make oils and liquid extracts. As well as making your dinner taste wonderful, this tasty herb has some astonishing health benefits. When taken for its medicinal use, garlic can help to treat a wide variety of ailments. 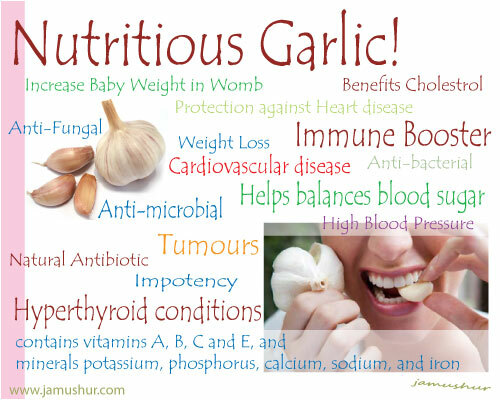 We have included 11 of the most amazing health benefits of garlic in this article. 1. Immunity: Garlic supports the immune system and helps to fight coughs, congestion and chest infections. Consider garlic during winter as an immune booster to ward off colds and flu. Dip a clove of garlic in honey if you feel the first signs of a cold. 2. Cardiovascular disease can benefit from taking garlic. Garlic has been shown to benefit LDL cholesterol and reduce the aortic plaque deposits that gather on the wall of veins. Studies have shown the incredible benefits of taking garlic in relation to heart disease. 3. Hyperthyroid conditions: Garlic makes a very effective treatment for hyperthyroid conditions, due to the high levels of iodine it contains. Taking the recommended dosage garlic has been shown to significantly improve this condition. 4. Impotency: Garlic is prescribed by many therapists to improve Impotency with good effect. The prescription is take 1 clove twice daily for a few months. 5. Fungal and bacterial vaginal infections are treated with garlic. Allicin is released when garlic is crushed. Allicin is a sulphuric complex that is a natural antibiotic. Garlic is reputed to have been used by soldiers in battle to treat infected wounds. 6. Garlic is an excellent source of vitamin B6 which is needed for a healthy immune system and the efficient growth of new cells. Vitamin B6 can also assist with mood swings and improve your emotional health. 7. Cancer: Garlic has been taken to prevent multiple types of cancer. Bladder cancer, prostate cancer, breast cancer, colon cancer and stomach cancer have all been shown to have their tumors reduced when treated with garlic. Vitamin B6 is said to have cancer fighting abilities. 8. Diabetes: Garlic regulates blood sugar as it enhances the level of insulin in the blood. This may assist in the control of diabetes. Be sure to seek medical advice if you believe the use of garlic could help your condition. 9. Scurvy is treated by vitamin C and garlic contains good levels of vitamin C too. 10. Pregnant women who eat Garlic can assist babies to gain weight while they are in the womb. Next time you have a baby prepare to eat garlic unless you have a history of large babies. 11. Garlic is reputed to scare hungry vampires away! There has not been much research on this question but it is worth mentioning here as an excuse to smile which does benefit health. If taking garlic supplements, ask your health store for a product that contains Allicin as it can be destroyed in some processes. Allicin which is rich is garlic is according to researchers acts to suppress the appetite and aid in weight loss. Eating garlic, a person eats less as it acts as an appetite suppressant as it gives the brain signals of satiety when it is eaten. Garlic ahs an effect of increasing the body’s metabolism. Garlic is supposed to stimulate the nervous system to release the hormone, Adrenalin, which increases metabolism. If you are looking to lose weight then, active metabolism can in turn help you to burn calories and lose weight. Studies show that consuming 900 mg garlic/day (equivalent to one half to one clove of garlic) could decrease total serum cholesterol levels by approximately 9%. There are over 200 nutrients contained in Garlic, including the volatile oil with sulphur-containing compounds allicin, alliin, and ajoene. It also contains the enzymes, allinase, peroxidase and myrosinase. Allicin is a powerful antibiotic and is also responsible for its characteristic strong odor. Ajoene helps as an anticoagulant. Garlic also contains citral, geraniol, linalool, Aphellandrene and B phellandrene. Some of these nutrients are found in some members of the onion family. It is suggested that a normal adult should not eat more than 3 cloves a day. Please do not consume high doses of garlic as it can be harmful to your health and you should never take more than the recommended dosage. Garlic is so effective because its nutrients and active properties enter directly into the blood stream. In addition when you sweat, garlic will leave your body through your pores. If you eat large doses this can increase body odour. If you are the only one taking increased doses of garlic, then your family and friends will thank you if you also chew a sprig or three of parsley after each garlic dose is recommended to combat the lovely aroma of garlic breath. This entry was posted in Nutrition and tagged garlic, nutrition on February 8, 2014 by activehealth.ie.